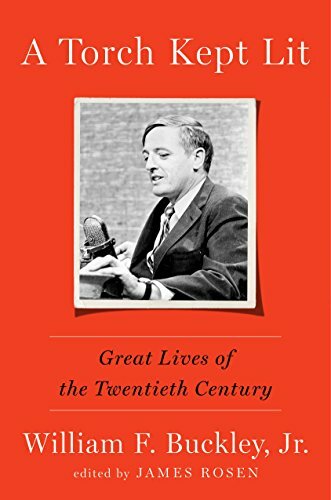 James Rosen, editor of A Torch Kept Lit: Great Lives of the Twentieth Century, a book of William F. Buckley's pieces on notable people during the conservative writer's lifetime, offers a piece in the Los Angeles Times on Buckley's many appearances on the Tonight Show with Johnny Carson. "Johnny Carson was amused by everything,” William F. Buckley Jr., the godfather of modern American conservatism, once observed about the King of Late Night. Buckley’s exposure to the dominant TV entertainer of the 20th century was, literally, episodic: the product of appearances on “The Tonight Show” so frequent that Buckley lost count of them. “I was his guest a half-dozen times,” he estimated after Carson’s death – by which time the figure was actually twice as high. Today, the regular presence on the leading late night TV shows of someone like Buckley, an aristocratic intellectual given to speaking in whole paragraphs, even other languages – he began one “Tonight” appearance with several sentences in Spanish – would seem, in a lineup dominated by actors and pop stars, glaringly out of place. Back then, however, Buckley fit right in and we were, as a nation, richer for it. It was in the 1960s and ’70s that Buckley and Carson reached the apex of their influence in their overlapping fields. As a magazine editor, syndicated newspaper columnist, college lecturer, spy novelist, talk show guest and host of “Firing Line,” the longest-running TV show with a single host, Buckley was even more of a multimedia phenomenon than Carson. What brought them together was an admirable appetite for eclecticism less discernible in our niche-targeted era: a Warholian conflation of High and Low that placed entertainers, athletes, politicians, novelists, intellectuals, psychics and oddballs on the same TV couch.